With a modern look and strong design, this vanity will help any bathroom look nicer. Made with a special brown particle board base and a white ceramic counter, this piece will make your bathroom look even nicer. The simple look of the double-door cabinet and drawers is useful and classic. This simple vanity set from Home Decorators Collection will fit right into any bathroom decor. Limited Lifetime Warranty. The product has been manufactured by WoodCrafters Home Products, LLC and is warranted under normal use and service, to be free from defects in material and workmanship for the life of the product from the date purchased. For more information, please review the full warranty information found in the installation guide of your product. For some added traditional style in your bathroom, choose this beautiful vanity. The good-looking white marble counter and brown solid wood base make a big difference in your bathroom. Its double-door cabinet and drawers have lots of room to keep all of your bathroom items. Put a nice touch on your bathroom's look with this vanity set from Wyndham Collection. For a bit of traditional style in your bathroom, choose this beautiful vanity. Its comes with a nice white marble counter and brown solid wood base for strength and style. Room is no problem with this vanity because it comes with a double-door cabinet and drawers. Bring a classic look and feel to your bathroom with this beautiful set from Wyndham Collection. Madeline 48.50-inch W 6-Drawer 2-Door Freestanding Vanity in Brown With Ceramic Top in White With a modern look and strong design, this vanity will help any bathroom look nicer. Made with a special brown particle board base and a white ceramic counter, this piece will make your bathroom look even nicer. The simple look of the double-door cabinet and drawers is useful and classic. This simple vanity set from Home Decorators Collection will fit right into any bathroom decor. 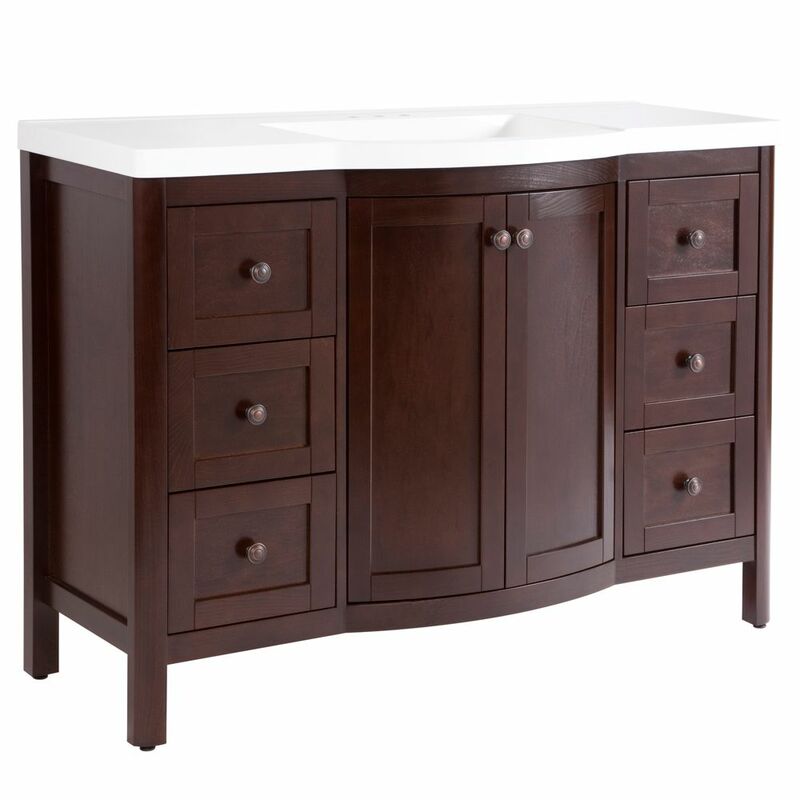 Madeline 48.50-inch W 6-Drawer 2-Door Freestanding Vanity in Brown With Ceramic Top in White is rated 3.6 out of 5 by 112. Rated 1 out of 5 by Till from Ordered three times, every time I received it, something was... Ordered three times, every time I received it, something was busted, scratched or missing. Winded up canceling order. Worst purchasing process ever! Rated 5 out of 5 by Marcy10 from Very well made vanity We picked this up at the Cobourg store after ordering online. Of all the Home Depot's we've shopped at, Cobourg is by far the best one. Fantastic customer service by employees who actually enjoy their jobs and know what they are talking about. We usually shop at the Belleville location but not anymore. The vanity is very well made and looks stunning in our renovated bathroom. Was easy to install. Rated 1 out of 5 by scottj from Poor Serviceability Had cabinet less than 2 months and door cracked and fell apart (wood was dry) went back to home depot, and they said they couldn't replace the door bring the cabinet back... Not easy once it is installed, and caulking done etc.! I reglued the door never right. However; we no longer have it because we had a leak from the sink and the cabinet was damaged, its gone. Went to a competitor and bought a higher end cabinet. do this vanity top come with a backsplash? Is there an option for cupboards instead of all 6 drawers? We have had nothing but problems with this product. The finish is pealing off each drawer and the doors on the front. Is it possible to get replacement fronts for the drawers and new doors?